In high school, I hated science. I despised memorizing terms, labeling body parts, and dissecting frogs. Over the past few years, I’m realizing that there’s one aspect of science that I find myself using on a daily basis. It’s the scientific method. The simple process of identifying a problem, developing a hypothesis, testing, and coming to a conclusion is a major part of marketing on the web. Marketing has changed as the internet consumes more and more of our lives – instead of developing a “waterfall-style” plan, marketers are forced to run experiments constantly. This can be a big issue as there’s always a constant stream of ideas that need to be tested and validated, something that is very time intensive. What if there was a way to boil down the backlog of assumptions, and focus instead on high-quality hypotheses? It’s also extremely important as a marketer to do the initial legwork without getting the engineering team involved. As a marketer, your goal is to deliver a compelling argument for why you need a specific feature in the product. This requires data, and not an idea. This is why you need the scientific method in marketing. This process is what I call minimum viable marketing. 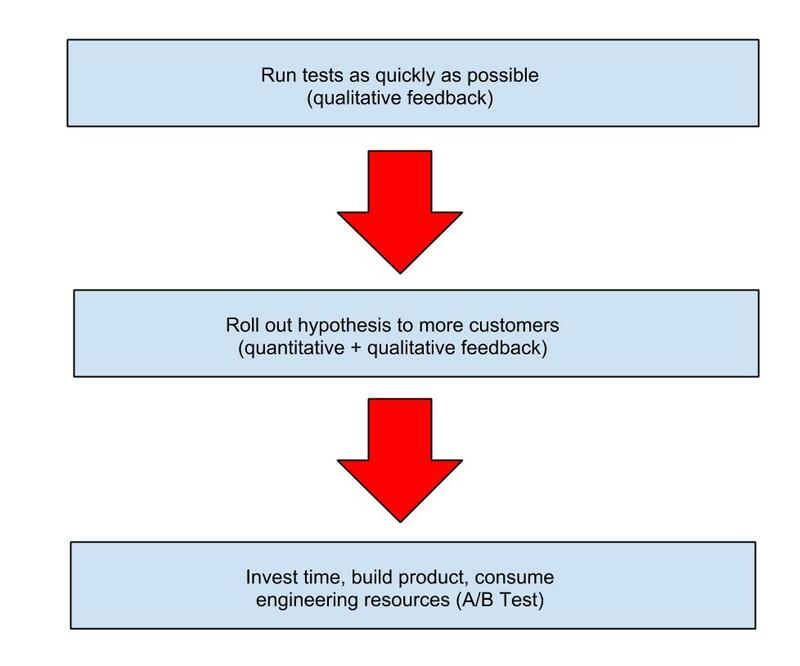 In short, it’s a process of using the scientific method to weed out weak hypotheses by focusing on customer feedback, speedy implementation of experiments, and a solid understanding of what data actually matters at different points of the experiment. Can the experiment be tested quickly? Is there an opportunity to receive qualitative feedback from customers? How long would it take to change/iterate on this experiment? Is there interest in my offering or what I have to say? Your time is valuable, and you need to find a channel to quickly run tests. This process can be something as simple as a Facebook post requesting feedback, a survey, phone call, or an in-person conversation. You have a hypothesis, and it needs to fail/succeed as quickly as possible. Qualitative feedback is a must; blankly staring at Google analytics reports will not help you in this phase! Notice how these experiments can easily be changed on the fly? In this step you are aiming for rapid feedback – your goal is to learn. Now it’s time to request a full-blown feature from the engineering team. Your hypothesis is still in its infancy, but it’s time to scale up the experiment a bit. This next step will probably consume more of your time, and here are a few examples of what kinds of experiments you can run. Don’t stress about your landing page being perfect – I have a friend who has little technical experience and uses Weebly to create landing pages and Unbounce for popups. It’s janky, but it works! For an early-stage bootstrapped company, this step can sometimes involve pre-selling. Remember, pricing is an important part of marketing! Lastly, collecting feedback doesn’t stop here! If you get quite a bit of traffic to your site, use Optimizely to run A/B tests on writing copy and layout. There’s a lot of hype around small optimizations (like changing the color of a button), while underrated areas like messaging fall by the wayside.